Phone tracking is not a rare thing in today's society, don't think it as a weird tracking action, on the contrary, it is your best way to protect your children and your family member's safety. Furthermore, you can use this function to track your lost phone or check whether your partner is cheating on you. And now if the one whom you want to protect for are using OnePlus phone, you can follow our OnePlus tracking tips to protect them in time. Three useful methods are ready for you to monitor OnePlus device remotely. Start it now! PanSpy is a professional phone tracking application which provide you a platform to monitor target Android device in real time. Android devices which run above 5.0 can all be monitored. What's more, panSpy possesses some special functions, setting a time limitation to restrict children from playing mobile phone, sending a notification once the person you monitored has left this area, restricting some words to search, making screenshot on target phone without a trace. Of course, you can look through different kinds of data include Call logs, Contacts, Messages, locations, Browser History, Photos, Keylogger, Apps, E-mails, Media and other phone data. Go to PanSpy official website and click SIGH UP to create your account first. Then active your account through the confirmation link you received. Login with your account and start to set the monitor. Choose Mobile Device - Android (currently only work for Android and we will open for iOS soon) and the edition you want. We provide Premium Edition and Ultimate Edition, you can click here to know more about the difference between them. Step 2: Install PanSpy on OnePlus. Once you successfully subscribed PanSpy, follow the download link to download PanSpy on your target OnePlus device. Login with your account and follow the instructions. Step 3: Start Tracking the OnePlus Phone. Now go back to your PanSpy Control Panel to start monitoring OnePlus device. 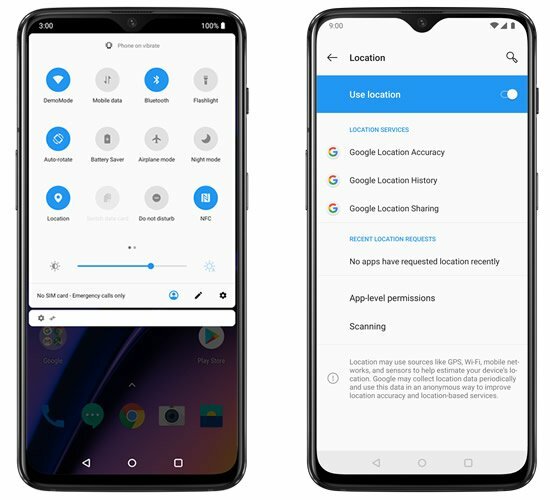 Select 'Locations' option and you can view the current location and previous spot of the OnePlus device. You can monitor other operations did on OnePlus device in real time as well. Step 1: Swipe down from the very top of the screen to open quick settings menu, then click the Location icon. Step 2: Sign in your Google account, then you can use Google Location Services to retrace your steps and share your locations with friends and contacts in real time. 'Find My Mobile' of OnePlus is currently in public beta, if you are using OnePlus 5, OnePlus 5T or OnePlus 6, you can upgrade to the latest beta version to experience this 'Find My Mobile' function. Step 1: Open 'Find My Phone'. You can open 'Find My Phone' function through 'Setting' >> ' Cloud Service'. Step 2: Use 'Find My Phone'. You can login to Cloud Service and enter 'Find My Phone' page to start locate your phone.